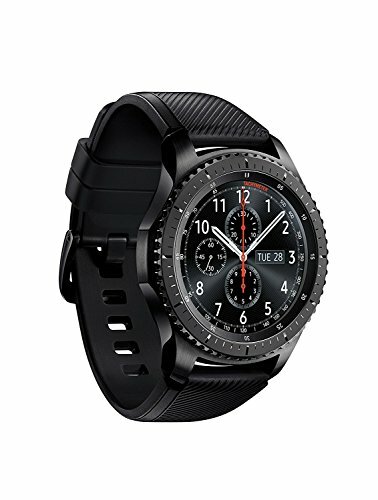 The Gear S3 Frontier Dark Grey timeless smartwatch combines style with the latest innovation in digital technology and delivers it directly to your wrist with an always on display Watch face 1.3" super AMOLED full color display. Compatible with select Bluetooth capable smartphones using Android OS 4.4 and later with at least 1.5GB RAM as well as iPhone 5 and later with iOS 9.0 and above. Not all features available with iOS paired smartphones. Gear S3 supported smartphones may vary by carrier and device. For a list of compatible smartphones and features, please visit samsung.com/gearS3. For best results, connect with compatible Samsung Galaxy smartphones. *Please note: This unit does not come with LTE capability and functions via bluetooth only. With the built-in S Health app, track your steps, monitor your heart rate, and more.